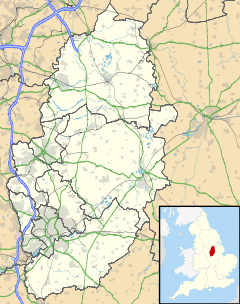 Awsworth is a village and civil parish in the Broxtowe district of Nottinghamshire, England. It had a population of 2,266 in 2001, reducing to 2,204 at the 2011 Census. The village is near the edge of the Greater Nottingham area, between Kimberley and Ilkeston, Derbyshire. Awsworth has been a civil parish since 1894. The parish church of St Peter consists of a remaining chancel from the brick church of 1746 and a nave which was rebuilt in 1902–03 by Naylor and Sale of Derby in a freely adapted Gothic style. A northwest tower was projected but never built. Awsworth once had a station on the Great Northern (later LNER) line from Nottingham to Derby which crossed the Erewash Valley to Ilkeston over the Bennerley Viaduct, closed in September 1964. At Awsworth Junction, a short distance to the east, a branch line curved away northwards to Pinxton. This line closed in January 1963. Near the junction it crossed a viaduct almost half a mile in length across the Giltbrook valley, known variously as Awsworth Viaduct, Giltbrook Viaduct, Kimberley Viaduct, but more commonly in the local area as the "Forty Bridges," though the actual combined number of arches and girder spans was 43. This viaduct is no more, but the Bennerley Viaduct is still in place. ^ "Civil Parish population 2011". Neighbourhood Statistics. Office for National Statistics. Retrieved 3 April 2016. Lee, John.M. (2006). A Brief History of Awsworth (First ed.). Thoroton, Robert (1797). History of Nottinghamshire. John Throsby. pp. 250–251. Wikimedia Commons has media related to Awsworth.